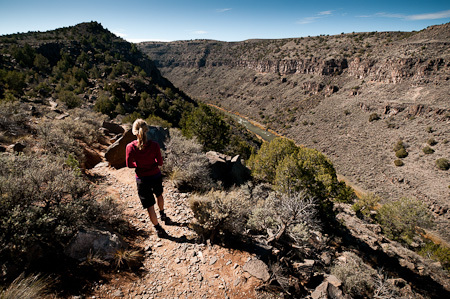 The high desert around Taos, New Mexico, is a vast and open expanse, intercut by the deep gash of the Rio Grande Gorge. 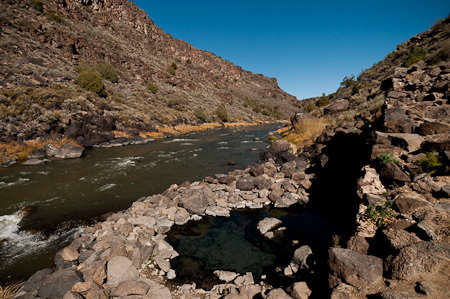 It’s a desolate, volcanic landscape that hides ancient petroglyphs, hot springs and crumbling ruins. In the last couple of decades, it’s also become the home to communities of off-the-grid-dwellers, sharing a new interpretation of the American Dream. 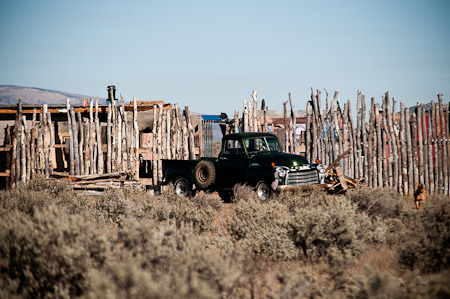 Resembling fantastical sets from a post-apocalyptic Hollywood movie, their abodes work in synergy with the land, harnessing the forces of passive solar heating with traditional adobe building techniques, using foraged-for recycled materials, like tyres, bottles and aluminium cans. At times, these dwellings are barely discernable above the desert sagebrush. Mole-like, their inhabitants have burrowed into the ground; escaping the summer heat, yet coddled by the warmth of the earth in the cold winter months. 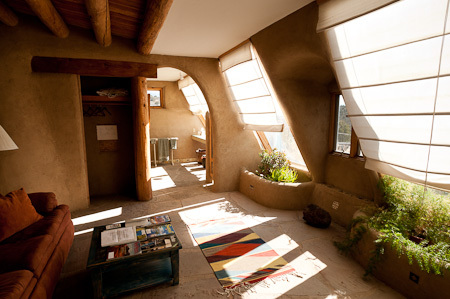 A low and squat earthship, characterised by its series of large windows for passive solar heating. 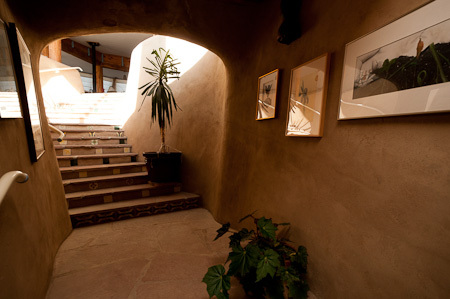 Thick walls provide thermal mass to regulate temperature. Handcrafted, Gaudi-like curves, embedded with recycled bottles. In harmony with nature, both practically and aesthetically. There’s a sense of belonging to these homes. 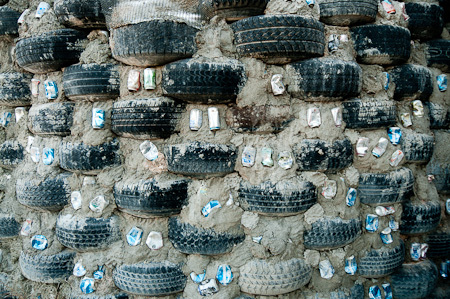 Recycling techniques at the Earthship visitor centre; old tyres and aluminium cans are key materials in earthship construction. Gateway to an alternative world. 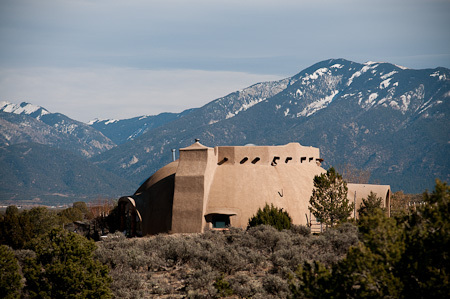 This adobe dwelling on the outskirts of Arroyo Hondo looked like it might be home to a family of Jedi Knights. Dotted amongst the desert around Tres Piedras were the shells of old school buses, their iconic yellow paintwork fading in the sun. This pickup seemed in good working order – most had their hoods ajar and engines surgically removed. 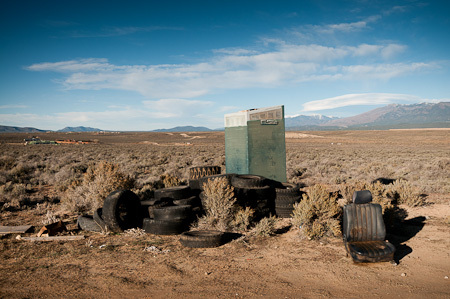 Desert junk to some. 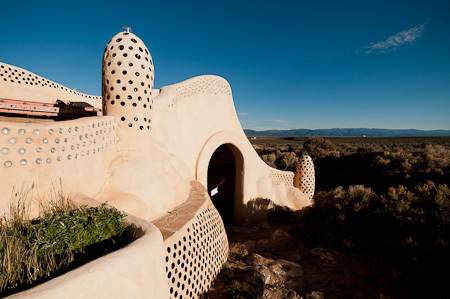 Earthship-building materials to others. 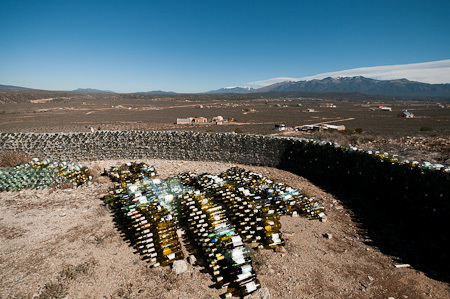 A wall built from wine bottles, of which there seemed to be plenty. 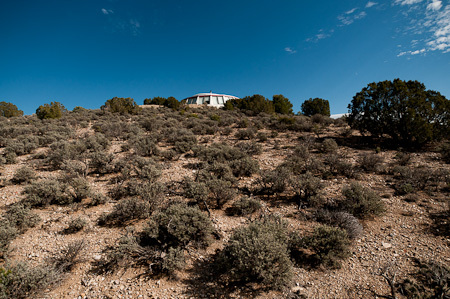 An earthship peeping out above the high desert sagebrush. 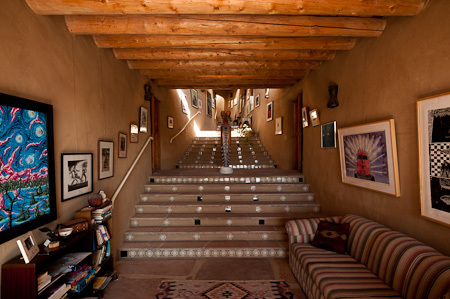 Dobson House earthship, built 17 years ago, also doubled up as a beautiful B&B. We’d have splurged and stayed there if we could, but it wasn’t open to guests that night. In the underground belly of Dobson House. 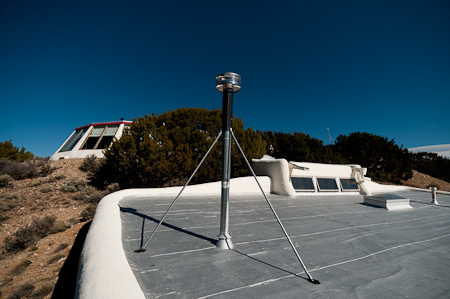 Here, scifi-style rooves provide insulation and help circulate air within. 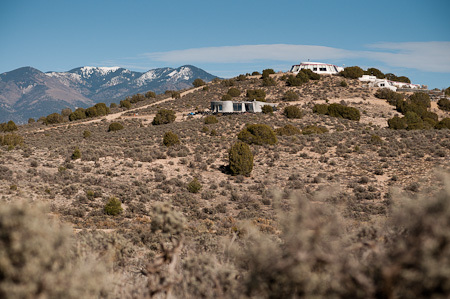 Great setting too, in the shadow of the Sangre de Cristo mountain range. 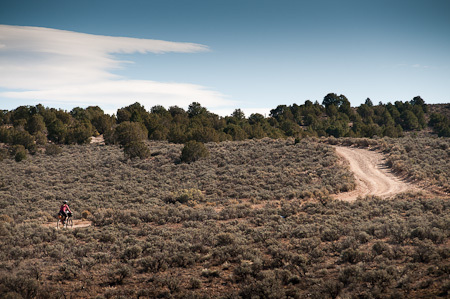 Dirt roads linked the various communities around Taos. 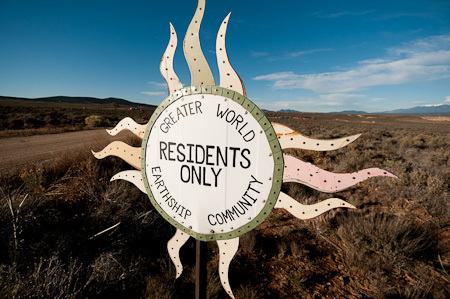 These areas are popular with all kinds: eccentrics, counter-culturalists, artists, creative thinkers, seekers of a more sustainable way of living, or simply those in search of desert solitude. Yep, no shortage of a little peace and quiet around here. … where pools of thermal water await. 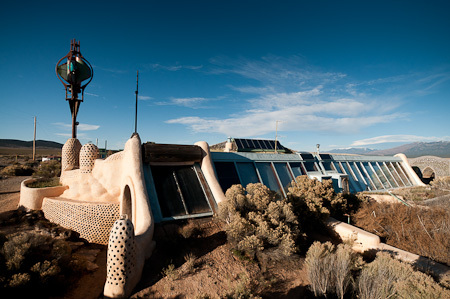 Treat yourself to a night in an earthship B&B, at Dobson House. 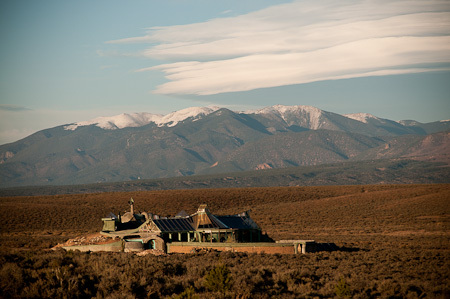 This entry was posted in New Mexico and tagged earthship, New Mexico, Taos on November 5, 2011 by Cass Gilbert. Look me up if you ever make it down to Brasil. My Troll is always ready to roll. Thanks Valentine. I hope to make it down there… eventually. Where are you at? I am a few hours north of Rio near Nova Friburgo. Thanks Valentine. My brother’s wife is Brazilian, so there is no excuse not to visit! Ah, I see you did find the Earthships. 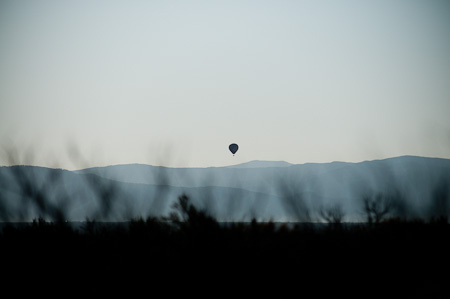 I’m embarrassed to say I only saw them entirely by accident, as I hadn’t intended to go in that direction I didn’t do any research, I didn’t even know much about Taos. When I was 15 I had my appendix out and while recuperating I was given a stack of science magazines (mostly the sadly defunct ‘Omni’), and I was fascinated by an article on the then very new Earthship concept. I resolved to go visit one day, and then forgot all about them. So when I cycled past I just thought ‘wow, those look familiar….’ As usual, I was late on the road so I only had a couple of hours to explore before I had to move on, but they are fascinating (although I wished then I had a better lens on my camera so I could zoom in a bit on all the interesting details). You hear about this but rarely get a real look. Interesting photos! Just out of curiousity since I came across your blog searching for info on the Panasonic GF1 as a travel camera. There are some great shots here (although I wish they were bigger…). Are you still using the GF1? I’ve been alternating the Lumix with my Nikon D300 at different points in the trip. To be honest, I don’t notice a great difference in image quality. I prefer the GF1 for size and weight, but I still find myself drawn to the DSLR for action stuff. Hi there. There’s a mix of D300 and Lumix pics. Since I’ve been back in the States, I’ve had the D300. Before then (the UK, Colombia etc…) it was the Lumix. Thanks. I agree about the GF1, but are also drawn to my DSLR for various reasons. Great shots nevertheless!